Brunch picks are standouts along with the multitude of appetizers and entrées. 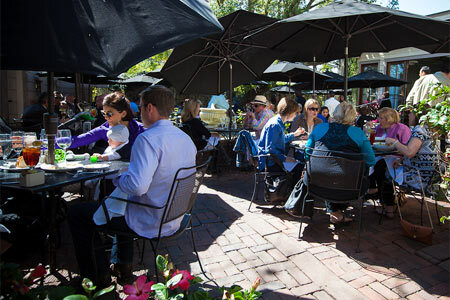 : Backstreet Café is situated in a renovated ’30s-era, two-story home sporting a sizeable patio in the backyard that sings during the Sunday jazz brunch. The restaurant’s favorite entrées are joined by brunch traditions like gingerbread waffles, frittatas and migas (eggs scrambled with corn tortilla strips, serrano peppers and tomatoes). Standout appetizers are the smoked corn crab cakes in citrus beurre blanc; sherried wild mushroom soup with Gorgonzola toast; and salmon-and-lobster rolls with ginger-soy-scallion sauce. Chef Hugo Ortega excels with seasonal menus; look for dishes such as Parmesan-and-sesame-crusted shrimp, mustard-crusted salmon and pecan-crusted chicken. But there are also treats like the jalapeño fettuccine, a goat cheese-stuffed chicken breast and a grilled rib-eye. Corn pudding and stone-ground cheese grits are tasty sides. You’ll also want something from sommelier Sean Beck’s wine list as well as the butterscotch bread pudding to finish.